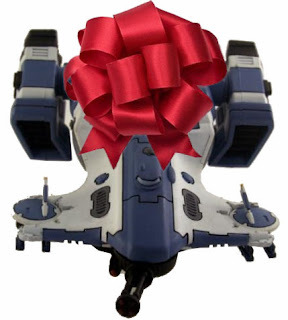 I hope Christmas finds you all warm and happy in the knowledge that some-where, some-how, and some-when a Tau railgun is blowing some Imperial dirtbag to little pink smithereens. I have good news and bad news folks. The Seahawks lost to those stinking Arizona red bird thingies, but I also have the great joy of announcing that my daughter and her fiancée (Mohawk Boy) have decided to learn how to play 40k. And thank God, it was about time. Her favorite 40k race? Tau. Yes please. But do you know how much money I am going to save by not having to buy her new models? She can just use mine, and I can get one of my other armies going. I have had my eye on a Sisters or Inquisition detatchment for my Templars! Neither detachment may add much to BT, but it will be fun. Her second choice is Eldar, and here again I don't really have to buy models for her. I have boxes and boxes of unassembled Eldorks in the garage that I have been waiting for the opportunity to assemble, and so here we go. And I'm off for the next two weeks... Should we start with the Wraithknight or the jetbikes? Oh yes, Virginia, it really is Christmas! At any rate, I am beside myself with joy. It is the best Christmas gift ever. I am so proud --well mostly. On the other hand, I am not proud that Mohawk Boy wants to play either Tyranids or Orks. I told him that he was welcome to play either of those two armies if he really wants to/ But I made it clear that if he so chose, then he would not be allowed any children with my daughter. Honestly, he would never be able to both feed those kids AND field an decent army, and I would hate for him to lose a game for lack of a proper presence on the table. I refuse to be embarrassed. But would it be worth my daughter's wrath? Oh well, it was worth a thought. At any rate, I am in a bit of a slump for writing material, so I am going to continue my series of articles on how to get started *playing* with Tau. The last articles actually related to what to buy, and you guys seemed to enjoy the posts. Now I am going to focus on how to configure what you have and how to use them. I will get the first one out this week entitled "Play Your Tau!" We have such an unhealthy relationship with the holidays here in the US. We should just resolve ourselves to saying "Happy Shopping!" Whatever you call it (and as I started this article), I hope it finds you warm, happy, and full of hope, children, grandchildren, railguns, stompas, whizz-bangs, nerf daggers, figgy pudding, good friends, and whatever else brings you joy. Nah that was 2 sets of good news for me as I am an Arizona fan. The Cardinals played their heart out! Congrats on your daughter getting into 40k man!